The needs of industrial groups drove the design of a new generation air-over-hydraulic pump that gives safer control of tasks while completing jobs. Manufacturing, machinery and vehicle maintenance, metal forming, lifting, pressing and testing applications contributed to Enerpac ’s 700 bar XVARI XA pump, which features high oil flow, with its rotating air motor and rotating two-stage pump element and is an alternative to pumps with linear motor and single piston. One of the engineers contributing to the pump’s design, Tony Cooper, traces the evolution of the 700 bar XVARI XA pump and reasons for the change it delivers. Compact air-driven hydraulic pumps, collectively known as ‘air-over-hydraulic pumps’, are an important product category in the global market for high pressure hydraulic power sources. These pumps are popular because they make use of standard workshop compressed air and are an alternative to electric pumps. Air-over-hydraulic pumps are used as an alternative to hand pumps. Air-over-hydraulic pumps act as a ‘’transformer’’. Workshop compressed air is transformed into hydraulic high force at a level that exceeds by far the capability of any pneumatic tool. Air-over-hydraulic pumps can power a variety of hydraulic actuators, such as cylinders, benders, crimpers, pullers and cutters. Earlier, Enerpac had introduced air-over-hydraulic pump, which was primarily used in automotive collision repair markets. Their use has spread to industries such as manufacturing, mining, machinery maintenance, electrical component production and testing and forming applications in industries such as construction and primary production. Air-over-hydraulic pump technology makes use of a reciprocating linear air motor that drives a single piston hydraulic pump. While this original proven design meets the needs of markets, the need for advanced hydraulic functions has also increased. ‘‘Closing daylight” applications refer to the non-productive time for a cylinder to run out and reach its position where it touches the load. This happens at zero or very low pressure where XA-series is about twice as fast as any air-over-hydraulic pump. In any industry, where these types of applications with conventional pumps are encountered (especially in fabrication markets), productivity gains can be achieved by qualities such as increased speed. High precision press operations are employed in situations where high precision parts must be pressed in a controlled manner. The major quality sought is controllability of the pressing operation. Manufacturing, maintenance and repair operations involve valuable and intricate parts (such as electrical components and pressing bearings on shafts, for example, where the pulsating motion of cylinders powered by air-over-hydraulic pumps can cause bearings to get stuck). Better control provides for more control to the operator resulting in less waste and better quality of the application. The quality required here is smooth movement at controlled speed. Testing for compressive strength of concrete or any other materials requires a precision amount of force. An example is the fabrication of sugar beet pallets that are used to determine the sugar content of the crop offered to the sugar processing factory. The pallets need to be accurately compressed within a narrow bandwidth to obtain consistent samples. Since air-over-hydraulic pumps are unable to do this to specification, the sugar processing industry makes use of hand pumps. A prime requirement of any testing laboratory is controlled speed. Vehicle maintenance and collision repair operations (CRO) make use of air-over-hydraulic pumps. Mechanics prefer fine metering in advance and in retract. Where the task involves repairs to trucks, for example, the straightening operation may involve multiple chains attached to the truck body with individual pulling rams powered by three or four pumps. In these applications, the fine metering of each individual pump is crucial for the quality and speed of the work. Enerpac developed an optimum pump design with a clean sheet of paper. End-users in all target markets provided crucial inputs that resulted in a comprehensive list of design guidelines. After mapping out all of the Voice of Clients (VOC) data, the Enerpac development team realised that the customer expectations for a new small air driven hydraulic pump could not be satisfied with the old reciprocating linear air motor technology. A clear sign was given by the VOC data that the market was ready to accept more hydraulic horsepower, leading to higher productivity, as well as preferring variable speed and fine metering to provide more control and safety to the end-user. There was also a demand for ergonomic improvements as end-users wanted a product that allowed them to keep both feet on the ground while operating the pump. The end-users also wanted a stable product that did not have the tendency to tip over and they wanted a pump less prone to contamination. 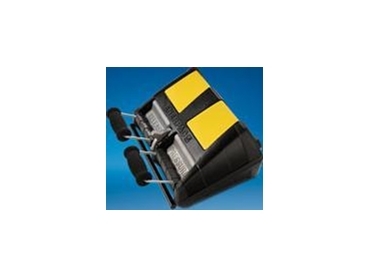 Enerpac introduced the 700 bar XVARI XA series, which had higher hydraulic delivery. The Enerpac development team achieved this by using a rotating air motor and a two-stage rotating pump element instead of a linear air motor. The pump element is driven by an eccentric shaft with cams for the separate drive of a low-pressure piston and a high-pressure piston. The cams are 180 degrees phased to eliminate vibration. A planetary gearwheel mechanism is placed between the air motor and the pump element to reduce the speed of the air motor (20,000 rpm) to the 2,000 rpm that the hydraulic pump runs. As a result of higher piston speeds, this configuration results in a smoother hydraulic flow as opposed to the pulsating hydraulic flow of the reciprocating linear pump technology. The advantage of the rotating air motor is that the speed can be accurately controlled by means of a throttle valve. By pressing the pedal further down, more air goes to the motor and the speed increases. This provides for a variable oil flow, so that the speed and positioning of the hydraulic cylinder or tool can be controlled more precisely. The user has now more control over the hydraulic application, resulting in better quality and more safety. For the pressure release function, the Enerpac development team invented a high-pressure metering valve with variable oil flow that allows the operator for precise load lowering. The high-pressure metering valve is accurately controlled by the release pedal. The more the pedal is depressed, the faster the cylinder retracts and the pressure reduces. This results in a better control over the retract function, for example, of a load that must be lowered slowly and in a controlled manner. In applications where controlled cylinder retraction is not required, the pedal can be fully depressed and the cylinder retract speed exceeds. The 700 bar XVARI XA series uses a collapsible rubber oil reservoir (bladder), making the pump less vulnerable for contamination from the outside. In this way, no air venting screws or openings to the outside are required, making the 700 bar XVARI XA series pump a fully closed hydraulic system. As a result, the pump can be used in horizontal and vertical positions and no dirt or debris can enter. The unit is provided with a foot-operated release lock that saves time when using slow-retracting actuators. For transportation, the pump is provided with an integrated (self-retracting) carrying handle. The footprint of the 700 bar XVARI XA series is larger and the unit is lower, preventing turn overs.